The Mediterranean diet is famed for its tolerance of alcohol and the fact that followers are actually recommended to include a moderated amount of red wine in their daily intake. In fact this is one of the factors that makes the diet so attractive to many dieters; there are not too many diets out there that feature alcohol as a healthy component. Here we look at the ideal drinks for a Mediterranean style diet. If there is one thing health professionals all over the world agree on it is the importance of water as the main drink in a healthy diet. The Med diet also promotes this, recommending at least six glasses of water per day. Water is the ideal drink as it is calorie free, and therefore can be consumed without any effect on body weight. As the body is made up from 60% water, it is vital to drink enough to maintain bodily functions, flush toxins, and simply maintain moist environments in areas such as the nose and throat. Even slight dehydration can lead to lack of energy, while extreme cases can lead to much more serious health problems. 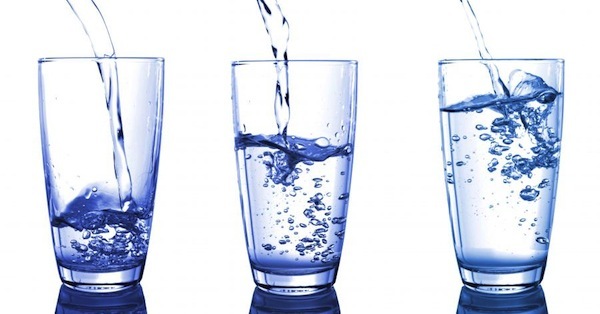 Six glasses a day is a good starting point for water intake. However, everybody is different and the amount of water required by the body is highly dependent on factors such as physical activity levels, body mass and composition and the environment you are in. Fluid requirements are likely to be a lot higher than this; however, it is assumed that you get some fluid from other drinks and even foods high in water. Drinking water with meals is very much part of the Mediterranean style of eating, and is the normal accompaniment to a meal (along with a glass of wine!). The Mediterranean diet does encourage a moderate intake of wine daily. Red wine is rich in antioxidants called polyphenols which lower levels of ‘bad’ LDL cholesterol and increase ‘good’ HDL cholesterol levels in the blood, meaning it is healthy for the heart. Although red wine gets most of the attention when it comes to heart health, there is evidence that all types of alcohol such as beer, white wine and spirits have some positive health effects when consumed in moderation. It is believed that all alcohol raises HDL cholesterol, reduces damage to arteries and helps to reduce the formation of blood clots. So everyone can enjoy a little of their favourite drop! The modern Med diet promotes an alcohol intake in line with American Dietary Intake recommendations. That is, no more than one standard drink a day for women and no more than two for men. It is not recommended that those who do not drink take up the habit, as it must be remembered that if over consumed, the detrimental effects to health far outweigh the positives. Too much alcohol is known to contribute to the development of some cancers, liver damage, cardio-myopathies, obesity and high blood triglycerides. Not to mention the social consequences. So if you do choose to consume a Mediterranean diet, make sure your alcohol intake is in line with guidelines for health. Fruit is a big part of a Mediterranean diet, and is often the chosen way to end a meal in this part of the world. Fruit contributes fibre and a huge amount of vitamins to the diet and makes an ideal low calorie healthy snack. Whilst fruit juices are an alternative to fruit in terms of nutrients and occasionally feature in a Med style diet, it is important to remember that they contain much more sugar and calories and less fibre than the whole fruit. A piece of fruit is likely to satisfy your hunger much more, due to the higher fibre. Juices do make a viable alternative to fruit on occasion, particularly 100% natural fruit juices which contain the pulp, as these are higher in fibre. However, it is best to limit them to occasional treats due to the high sugar count, especially if you are watching your weight. Some fruit juices are as high in calories as the equivalent volume of soft drink, and although much more nutritious, will cause weight gain in exactly the same manner. Fruit juices from berries or grapes may be the best choice on the Med diet, as these tend to be lower in calories and red berries often contain polyphenols similar to those found in red wine, which are thought to be beneficial for heart health. In some parts of the Mediterranean, coffee is a major part of life, and is rarely missed at breakfast or after a meal. It should be noted however, that the coffee in Mediterranean countries is not supersize lattes with half a litre of milk and whipped cream on top. Coffees are generally small, and therefore contribute few calories to the diet. It should be noted though, that excessive caffeine intake is not advisable for good health and in general coffee should be limited to three cups per day. Although tea is not traditionally part of the Med diet, its antioxidant properties mean that it fits well into a Mediterranean style of eating and in fact is allowed on many Med diet eating plans. Similar to red wine, tea contains polyphenols which are healthy for the heart. Herbal and green teas may also be an appropriate addition to a Med style diet, as they are known for also having antioxidant properties and contribute almost no calories to the diet. Yoghurt is a popular food in many Mediterranean countries and therefore drinks based on yoghurt, such as the Greek Ariani could be included in a Med diet. This is basically Greek yoghurt, diluted with water and salt, quite different from the highly sweetened fruit based commercial yoghurt drinks we are used to. A moderate intake of dairy products is recommended on the Med diet, therefore as an occasional beverage this type of drink is a good choice and will contribute calcium, protein and vitamins to your diet. The Spanish tiger nut based drink Horchata is another choice that fits into the Med diet. The tiger nut has similar nutritional qualities to the olive, and is high in unsaturated fats. This drink, particularly commercially prepared varieties, can be high in sugar, so limit to an occasional option. Almond milk is also a healthy Mediterranean style beverage. Contributing those healthy benefits found in the nuts themselves, namely unsaturated fats that improve blood cholesterol. Milk drinks of any type, however, should not be consumed as the main drink in a healthy diet, as they contribute too many calories and will lead to weight gain. The ideal drink for a Mediterranean style diet is water, and lots of it, with a little wine. Other drinks that have nutritional benefits may also be appropriate on a Med style diet, provided they are occasional choices. Drinks that have no place in a Med style diet include high sugar drinks that have no health benefits such as soft drinks, cordials and ‘fruit’ drinks. Unfortunately as more and more of these types of drinks (in addition to fast food), find their way into the diet of the Mediterranean people, we are seeing greater rates of obesity and lifestyle disease not previously seen in this population. Previous post: What is a good Mediterranean diet breakfast?